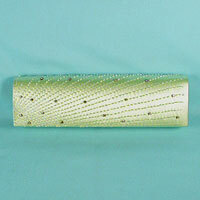 Long sparkle satin clutch bag with beads and rhinestones. 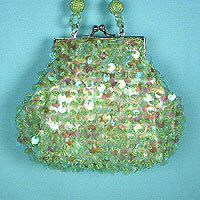 This bright evening bag has is gathered on the side with a large bead and rhinestone round ornament. It is lined in satin with a side pocket. It has a metal frame with a kissing ball clasp closure on a handle. Measurements: width 11", height 5", depth 2"
Color: lime. Hue: limesickle. color code: #D4FF97. Color: lime. Hue: limeaid. color code: #EAFF97. Color: green. Hue: jade. color code: #006A55. 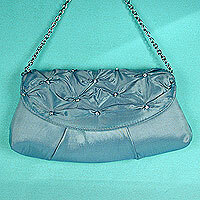 Satin evening bag with rhinestone trim. 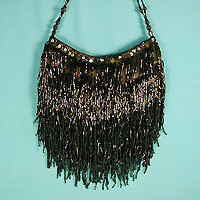 This lovely purse has criss cross tucks on the curved flap with a wide crystal rhinestone band around the edge. The band is styled with both small and large rectangular stones. The sides are curved and the length across the top shorter than the bottom. Lined in satin, it has a small pocket inside. It closes with a magnetic snap and has a shoulder chain with a 22-inch drop. 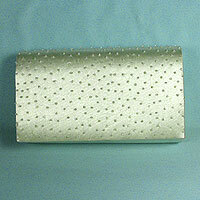 This is a great clutch bag for evening and special events. Color: green. Hue: green. color code: #00FF00. Measurements: width 10½", height 4", depth 1-3/4"
Small metal pill case with design on top. 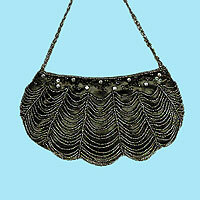 This lovely evening bag accessory is designed with a gold metal case with a white background on top. The design includes a butterfly, a flower and leaves. 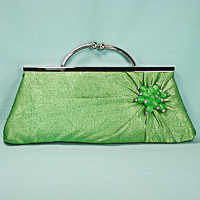 It is small and fits well into an evening purse, clutch bag or regular handbag. Color: green. Hue: green. color code: #00FF00. Type: hf. 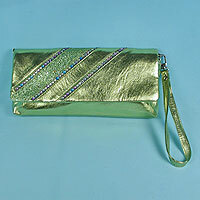 Sparkling evening clutch bag or evening purse with short chain handle, rhinestone trim and snap closure. 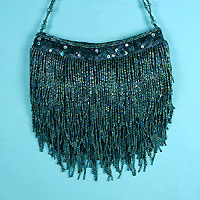 This lovely evening bag is fashioned in iridescent sparkle satin, has pleats in the front and an oval flap that laps over the back with tucks centered with rhinestones. It has a retractable handle chain with a 6-inch drop and a magnetic snap closure. The html color is medium aqua marine. Color: green. Hue: moss. color code: #3E6A00. Measurements: width 10", height 5", depth 1-3/4"
Color: forrest. Hue: dark forest. color code: #1B4F45. 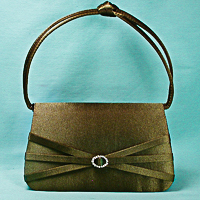 Evening bag with knotted stand-up handle and rhinestone trim on flap. 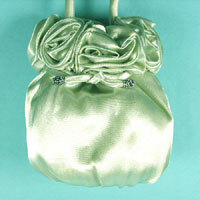 This cute purse is made with satin, sparkle satin, or lame depending on the color. 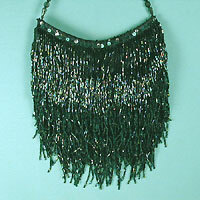 It has crossing straps on the front of the flap with a round rhinestone decoration at the center. It includes a matching shoulder cord with a 22-inch drop and is roomy enough for a cell phone. It&squot;s perfect for proms and evening parties. Color: avocado. Hue: avocado. color code: #557527. Type: satin. Measurements: width 6½", height 3½", depth 2"
Color: avocado. Hue: avocado. color code: #557527. Type: bronze.